The cardiac action potential is what the cardiac cells utilize in order to propagate action potentials and allow cell membranes to act as a stimulus to adjacent cell membranes. Through the cardiac action potential, excited cells propagate from one to the other allowing the conduction of energy and cardiac contraction. 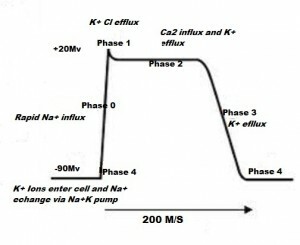 Phase 0 is the phase of a stable resting action potential, when the cells are polarized and in an excitable state awaiting a stimulus, which will cause rapid depolarization. When a stimulus above the threshold potential strikes the cell the cell begins to depolarize. Sodium ions rush into the cell causing the electrochemical gradient between the inside and outside of the cell to rapidly move towards zero. Phase 1 is known as the depolarization phase in which the electrochemical voltage change is so rapid that the voltage overshoots the zero potential and stops out around +20mV. Phase 1 is a very short phase where the potential difference comes to rest near 0mV. During phase 2 of the cardiac action potential the fast sodium channels close and the influx of sodium ceases completely. While this is happening, the potassium ions continue to be depleted from the cell resulting in a small decrease in positively charged ions within the cardiac cell membrane. 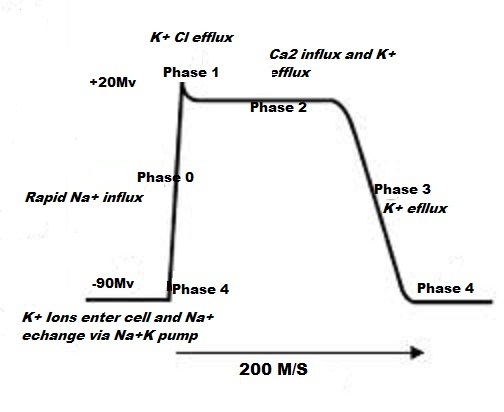 Phase 2 of the cardiac action potential is known as the plateau phase where the cell membrane action potential is maintained near 0mV by the infusion of calcium ions. Calcium enters the myocardial cells, causing a large secondary release of calcium and causing contraction of the myocardium. The cell is in a prolonged depolarized state and restoration of the resting membrane potential is beginning to take place. Phase 3 is known as the rapid repolarization phase. This phase is initiated by the closing of the slow calcium channels, which leads to an increase in cellular permeability and efflux of potassium. Repolarization is completed by the end of this phase of the cardiac action potential, and the cell is restored to its repolarized state of -90mV. Phase 4 identifies the period between action potentials and the cell is repolarized and ready to fire again. During this phase the cell is negatively charged compared with the extracellular areas. There is an excess of sodium ions within the cell and potassium ions outside of the cell. The sodium and potassium pump is commenced and sodium is slowly pumped outside of the cell, while potassium enters the cell, raising the resting potential of the membrane so that the entire process can occur again. Return to: ECG Interpretation Tutorial.